Mare Dibaba of Ethiopia competes during the Women's Marathon on Day 9 of the London 2012 Olympic Games at The Mall on August 5, 2012 in London, England. Mare Dibaba enters the 2014 Bank of America Marathon with the third-best time in the field, a 2:19:52 she clocked at the 2012 Dubai race. 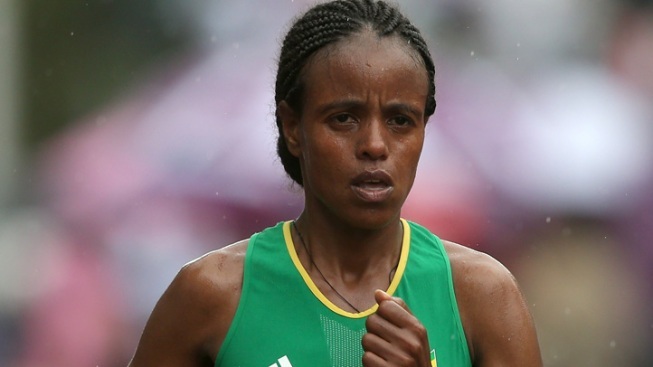 The Ethiopian already has a win under her belt this year, winning the Xiamen Marathon in a course record 2:21:36. Other career highlights include a second place finish in the 2011 Toronto Marathon, a third place finish in the 2011 Los Angeles Marathon and a third place finish in the 2010 Rome Marathon. Dibaba is one of several participants with the talent to break 2:20 on Oct. 12, but even that won't guarantee a win among this solid field of athletes. Elliot and his wife, Allie, are running for SmileTrain Team Empower, an international charity that provides cleft palate surgery to those in need.